Were you to travel to the tropical Malaysian jungles where Rafflesia or corpse flower lives to bring home a Rafflesia plant, you wouldn't be successful. That's because in the traditional sense, there is no Rafflesia plant. Technically the plant belongs to the plant kingdom, but challenges definitions because of its lack of chlorophyll, making it incapable of photosynthesis, according to Western Michigan University. The stems, roots and leaves of about 17 species of parasitic Rafflesia exist as thread-like organs that are totally embedded in the tissues of the host plants, a grape vine relative in the genus Tetrastigma. 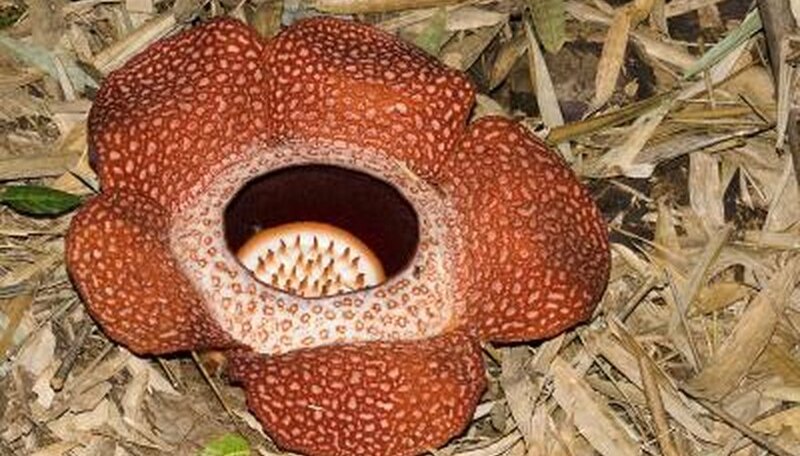 The only part of the plant ever seen is the flower, which can be up to 3 feet wide and weigh 15 pounds in Rafflesia arnoldii, making it the world's largest flower. It isn't possible to grow Rafflesia in cultivation. All Rafflesia species flowers have the odor of rotting flesh, and their colors mimic decaying meat. Mostly in shades of red, brown and orange, the base color is ornamented by many warty dimensional structures usually in a lighter color of cream to tan. The flower's smell was described in 1928 by the Swedish scientist Eric Mjoberg as having "a penetrating odour more repulsive than any buffalo carcass in an advanced stage of decomposition." Rafflesia flowers are leathery with five petals that unite toward the flower's base. A raised disk encircles the central chamber that contains the flower's reproductive organs. Each flower is either male or female. Male flowers have pollen-bearing stamens and female flowers have stigmas with an ovary that can develop into a fruit. In the middle of the flower is a raised disk that has spike-like projections coming from its top. The projections may help spread the flower's scent and radiate heat. The reproductive parts are tucked in the heart of the flower at the base of the disk. The location of a Rafflesia plant is finally apparent when the parasitic plant is old enough to flower. The thread-like Rafflesia plant parts take nourishment from the Tetrastigma host until they can form a flower bud. First, a lump forms, and as it grows, it breaks through the bark of the host vine, which is located on the forest floor. The bud then somewhat resembles a cabbage. It takes about nine months for the bud to grow big enough to open, but most don't make it to maturity. About 80 to 90 percent of the developing flower buds die. The Rafflesia flower lasts for five to seven days. The flower has bright color for the first two days it's open. The color begins to fade, brown discolorations appear and the flower darkens. Finally, the flower turns black and rots. If fertilized, a female flower produces a round fruit about 6 inches wide filled with many small seeds. An open Rafflesia flower is a noteworthy event, and an ecotourism industry centers around bringing tourists to see them. Flies or beetles visit the flowers when they are open. If the insect contacts a stamen, a mass of pollen is deposited on its back. For fertilization to occur, the insect must then find a female flower and contact its stigma. Rafflesia probably has a low pollination rate because male and female flowers often aren't open at the same time in the same area and because of the short flower life. The Library of Congress: Everyday Mysteries: What Is the Largest Flower in the World?